Where else can you listen to Led Zepplin and taste an amazing Cabernet Sauvignon but at Cliff Lede Vineyards located in the heart of the Stag’s Leap District. I was greeted by Rikki, who would be giving me a personal tour of this stunning property. 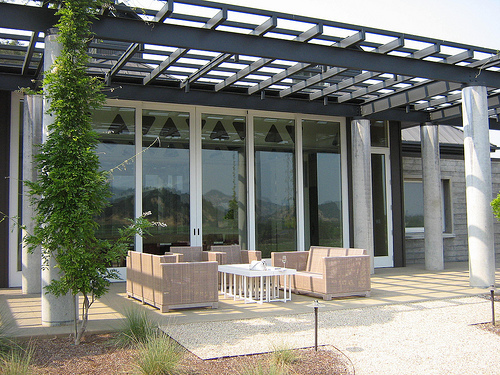 The open and airy tasting room leads you to the outdoor patio area, providing an amazing view of the vineyards. 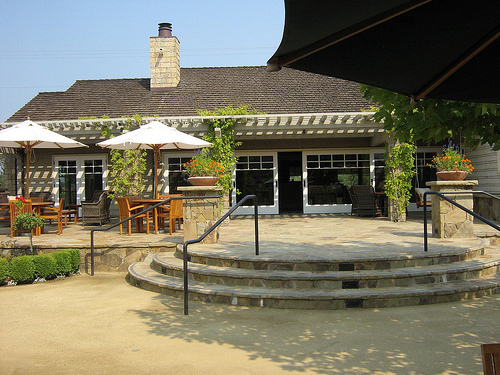 On the property is a contemporary art gallery that combines the owner’s love and appreciation of art and wine. 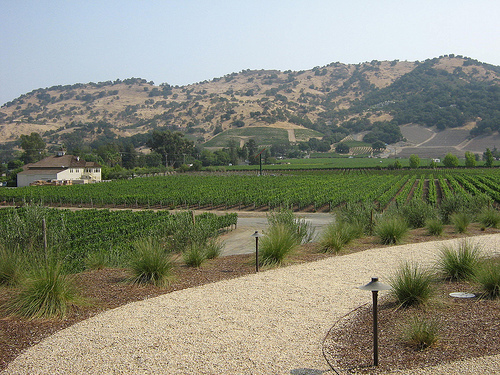 Since the owner is also a lover of great rock music, each block of the vineyard is named after a rock song such as “Hotel California”, “Light My Fire” and “Stairway to Heaven”. The stunning cellar located on the south-west side of the vineyard boasts an amazing view of the valley floor below and the steep hillside vineyards to the east (Vacas Mountain Range) with the Poetry Inn nestled right up there. I loved looking into the fermentation room and seeing the picture of Grace Kelly keeping her watchful eye on the winemaking process. During my visit, I tasted the 2007 Sauvignon Blanc, which had lots of tropical fruit notes on the nose and in the mouth, like mango. For such ripe fruit and high alcohol the wine still had great acidity with a medium finish. I also lucked out and was able to taste the sold-out 2005 Sauvignon Blanc. The amazing thing was that the 2005 still holding its own, showing lots of fruit and great acidity even though it was already 3 years old But the kicker for me was the 2005 Cliff Lede Cabernet Sauvignon which is 100% from the Stag’s Leap District. Lots of black currents, black cherry, bitter chocolate, baking spices and cloves. The fruit and alcohol were extremely well integrated and the layers of complexity of this wine was so refine. I can see this wine being able to age another twenty years, if you have the patience, but it can be enjoyed now with a nice medium rare steak or lamb kabobs on the BBQ. Or, even better, pair this wine with some great classic rock.